Married Name 20 October 1914 As of 20 October 1914,her married name was Maier. Elizabeth Kruchten was born circa 1897 at Wisconsin. She married Adam F. Maier, son of George Maier and Anna Schmitt, on 20 October 1914. Elizabeth Kruchten died on 24 December 1976. Rose Maier was the daughter of Adam F. Maier and Elizabeth Kruchten. Rose Maier married Greg Endres. Greg Endres married Rose Maier, daughter of Adam F. Maier and Elizabeth Kruchten. Name Variation Florina Maier was also known as Florince. Married Name Her married name was Lenerz. Florina Maier married Howard Lenerz. Florina Maier was born circa 1925 at Wisconsin. She was the daughter of Adam F. Maier and Elizabeth Kruchten. Howard Lenerz married Florina Maier, daughter of Adam F. Maier and Elizabeth Kruchten. Herbert J. Maier was born on 7 November 1926 at Wisconsin. He was the son of Adam F. Maier and Elizabeth Kruchten. Herbert J. Maier married Dolores Barry on 17 June 1950. Herbert J. Maier died on 4 July 2010 at age 83. Married Name 17 June 1950 As of 17 June 1950,her married name was Maier. Dolores Barry married Herbert J. Maier, son of Adam F. Maier and Elizabeth Kruchten, on 17 June 1950. Married Name Her married name was Pings. Married Name before 1985 As of before 1985,her married name was Dederich. Darlene Maier was born circa 1935 at Wisconsin. Darlene Maier married Kenneth Dederich before 1985. Name Variation Joann Maier was also known as Joan. Married Name Her married name was Riechman. Joann Maier married Michael Riechman. Joann Maier was born circa 1939 at Wisconsin. Name Variation Michael Riechman was also known as Mike. Michael Riechman married Joann Maier, daughter of Adam F. Maier and Elizabeth Kruchten. Name Variation Laverne John Maier was also known as Vern. Name Variation Laverne John Maier was also known as LaVern. Laverne John Maier was born circa 1932 at Wisconsin. Laverne John Maier married Betty Jean Anhalt, daughter of Marcellus Anhalt and Mayme Shepherd, on 28 January 1950. Laverne John Maier died on 8 June 2002. Married Name 28 January 1950 As of 28 January 1950,her married name was Maier. Betty Jean Anhalt was born on 2 September 1931 at Richland, Wisconsin. She was the daughter of Marcellus Anhalt and Mayme Shepherd. Betty Jean Anhalt married Laverne John Maier, son of Adam F. Maier and Elizabeth Kruchten, on 28 January 1950. Betty Jean Anhalt died on 30 June 2012 at age 80 Betty Jean Maier, age 80, of Roxbury, passed away peacefully on Saturday, June 30, 2012, at her home surrounded by her loving children. Betty, daughter of Marcellus and Mayme (Shepherd) Anhalt was born on Sept. 2, 1931, in the Town of Willow in Richland County. She married the love of her life, Laverne John Maier, on Jan. 28, 1950. Their marriage was blessed with 10 children, Mitch (Sandy), Mary, Michael (Marcia Meise), Mark (Dianne), Maurice (Rhonda), Renee (Dennis) Frey, Monte (Roxi), Roxann (Ron) Lenz, Rochell (Roberto) Colon, and Rebecca (Ted) Frey: also 29 grandchildren, Adrian, Lauren, Marissa, Joshua, Jennifer, Korin, Mary, Caleb, Beth, Alyssa, Adam, Amanda, Benjamen, Ravin, Cole, Kori, Wyatt, Jessica, Jamie, Michael, Mathew, Cameron, Brianna, Steve, Stephanie, Jacob, Jebediah, Kaleb and Lily; a grand-dog, Cody; 18 great-grandchildren and four on the way. The love story between Betty and Vern began when Betty’s family moved to Sauk City as Betty was entering fourth grade. It was then that Betty met a boy named LaVerne. When she entered high school, the only way her dad would let her go to the football games was to become a cheerleader. She had to keep her eye on the boy with the broad shoulders. The cheerleader and football player became high school sweethearts and then happily married in 1950. They had their wedding dance at a dance hall in Roxbury, which they purchased nine years later. Together they expanded the dance hall into a full-fledged supper club known as the Dorf Haus where Betty worked alongside her husband as co-owner and wore many hats including, waitress, hostess, bookkeeper, and the best cook around. Betty served as vice president of the Wisconsin Restaurant Association, but her biggest and most rewarding accomplishment was raising her family. She loved them most of all. During the course of their lives, Betty and Vern worked hard, but also made time for fun. They enjoyed dancing, playing cards, traveling with their family and friends, curling, golfing, bowling, and hunting for antiques. Betty loved sports and a Sunday wouldn’t be complete without football, baseball, or golf. Betty and Vern instilled in their children a strong faith in God and that family was most important. Betty will be forever remembered for her beautiful smile, contagious laugh and her grace and kindness. Her positive attitude was accentuated after her diagnosis with pancreatic cancer on July 4, 2009. She led her life by example and taught all those who knew her that a positive attitude can take you a long way. A matriarch to her children, grandchildren and great-grandchildren, her strength and legacy will live on. Betty is survived by her children; grandchildren; great-grandchildren; her sisters, Mary (Bill) Hahn, Barbara (Francis “Shorty”) Young, and Marcella (Ralph) Breunig; sisters-in-law, Rose Endres, Florina Lenerz, Betty (Bud) Hutter, Darlene (Gene) Pings, Joan Riechman, and Dolores Maier; and many nieces, nephews, relatives, and friends. The perfect love story lives on as Betty joins Vern, her husband of 62 years of marriage, just 22 days after his passing. She was also preceded in death by her parents, her infant daughter, Mary; her son, Michael; infant granddaughter, Lara, brothers-in-law, George Maier, Edward Mulhall, Greg Endres, Howard Lenerz, Herb Maier, Ken Dederich, Mike Riechman, Ron Maier and sister-in-law, Ann Mulhall. A Mass of Christian Burial will be held on Friday, July 6, 2012, at 11 a.m. at St. NORBERT’S CATHOLIC CHURCH in Roxbury, with Father John Blewett and Father Gary Wankerl presiding. Burial will be at the Garden Bluff Cemetery, Lodi. Friends may call on Thursday, July 5, 2012, from 3 p.m. to 7 p.m. at HOOVERSON FUNERAL HOME in Sauk City. Friends may also call on Friday at 10 a.m. at the funeral home prior to mass. John Maier was the son of Herbert J. Maier and Dolores Barry. John Maier died before 2010. Barry Richard Maier was born on 27 September 1961 at Wisconsin. He was the son of Herbert J. Maier and Dolores Barry. Barry Richard Maier died on 22 February 1962. Teddy Adam Maier was born on 10 April 1958 at Wisconsin. Teddy Adam Maier died on 8 June 1985 at Wisconsin at age 27. George Maier was the son of Adam F. Maier and Elizabeth Kruchten. George Maier married Florentina (?). George Maier died before 1985. Raymond Maier was the son of Adam F. Maier and Elizabeth Kruchten. Raymond Maier died before 1985. Ronald Maier married Mary Jane (?). Ronald Maier was born circa 1937 at Wisconsin. Ronald Maier died between 1985 and 2010. Married Name Her married name was Mulhall. Ann Maier was the daughter of Adam F. Maier and Elizabeth Kruchten. Ann Maier married Edward Mulhall. Ann Maier died between 1985 and 2010. Edward Mulhall married Ann Maier, daughter of Adam F. Maier and Elizabeth Kruchten. Edward Mulhall died before 1985. Jim Hutter was the son of Arthur Nicholas Hutter and Matilda Peterson. Jim Hutter died before 2014. Marcellus Anhalt married Mayme Shepherd. Married Name Her married name was Anhalt. Mayme Shepherd married Marcellus Anhalt. Engelbert Walch married Mary Reuter. Married Name Her married name was Walch. Mary Reuter married Engelbert Walch. Married Name 22 October 1922 As of 22 October 1922,her married name was Mears. Dorothy Bertha Smith was born in 1905 at Washington. She married George Walter Mears, son of Michael Mears and Anna M. Kaney, on 22 October 1922 at Olympia, Pierce, Washington. Dorothy Bertha Smith and George Walter Mears were divorced in 1935 at Washington George Walter and Dorothy Mears divorce. 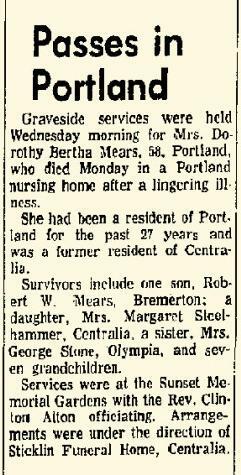 Dorothy Bertha Smith died on 2 September 1963 at Oregon Dorothy Bertha Mears obituary. Robert Wallace Mears married Annabelle (?). Robert Wallace Mears was born on 10 December 1923 at Washington. He was the son of George Walter Mears and Dorothy Bertha Smith. Robert Wallace Mears died on 1 December 1972 at Washington at age 48 Robert W Mears obituary. Fritz Harold Steelhammer was born on 12 February 1888 at Michigan. He married Clara Harriette Miller on 12 May 1918. Fritz Harold Steelhammer died in September 1974 at Washington at age 86. Married Name 12 May 1918 As of 12 May 1918,her married name was Steelhammer. Clara Harriette Miller was born in 1889 at Iowa. She married Fritz Harold Steelhammer on 12 May 1918. Clara Harriette Miller died on 3 August 1962. Herman Harry Frederick Krueger was born on 20 September 1888 at Wisconsin. He married Edna Florence Mears, daughter of Michael Mears and Anna M. Kaney, on 14 June 1917. Herman Harry Frederick Krueger died on 30 November 1941 at Wisconsin at age 53.